The California WaterFix (WaterFix) and EcoRestore is a state of the art, real solution to modernize, repair and protect California’s aging water delivery system from the north. Currently, Californians receive two-thirds of their water supply from a source that begins in the Sierra Nevada Mountains and flows through the state’s main water distribution system through the Sacramento-San Joaquin Delta (Delta). The Delta’s complex, maze-like waterways are supported by a series of man-made dirt levees, and are highly susceptible to collapse from flooding and earthquakes. Experts warn that damage to Delta caused by a natural disaster could cut off water supplies to millions of people for weeks, months or even years and burden the economy with billions of dollars of debt. There are many problems with the Delta in its current state. 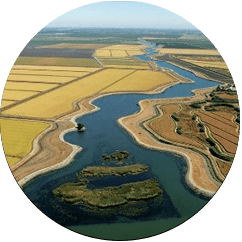 Since the 1800’s the Delta has been altered to support farming, transportation, commerce and housing development which has in effect, harmed many species that pass through the Delta. The current pumping system causes reverse river flows and fish are getting caught in the screens or pulled off their migration paths. Additionally, each year during heavy winter storms, thousands of acre-feet (AF) of water are lost to the ocean because of outdated infrastructure. The WaterFix was selected as the best long-term plan for the Delta after nearly a decade of review, planning and analysis with unprecedented public input. The plan is supported by scientists, water specialists, engineers, conservationists and other experts, and has been designed to protect water supplies by implementing the use of state of the art construction techniques, improved fish screens and a modern two tunnel system 150 feet underground. This design will improve reliability, and will enhance the ability to capture water and move it to storage facilities throughout the state so we can use it when we really need it. Adopt a resolution indicating your support of the proposed project. Actively engage your fellow State and Federal elected officials to make this a priority for California and push for a solution. Oppose any legislation that impedes or delays the advancement of completing the project. forward with the California WaterFix.